I started at Mountain Challenge and have continued on even after my graduation. Even though it seems like I make it out a little less frequently each year I still value every experience and event I get to participate in. As part of freshman orientation at Maryville my class spent a day climbing the alpine tower and doing the low ropes course. I started speaking with the staff and learned about all the different activities Mountain Challenge was involved in and that I could work there as well as student staff. I immediately started shadowing events and learning the ropes. It was amazing getting involved with Mountain Challenge; I was getting to spend my time with amazing people that quickly became some of my best friends doing activities that I enjoyed. 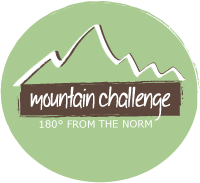 It’s so hard to pick just one memorable experience at Mountain Challenge. From how it changed me and brought me out of my shell and gave me the confidence to lead groups to seeing how many participants pushed themselves out of their comfort zones to achieve what they couldn’t have imagined themselves doing. One of my favorite memories was having a participant on the climbing tower who was terrified of heights. She did not want to leave the ground and each step she took up the tower was a lengthy struggle. Each time she paused I would assure her that she was secure and if she was done that would be fine. Soon the rest of the group also gathered around to cheer each step she took and the other participants on the tower helped talk her through the climb and tell her where to place her hands and feet. The rest of the team became so supportive and encouraging that my participant managed to put aside her fears and slowly make her way to the top. By the time she made it back to the ground she was crying because she had just exceeded anything she had thought she would be able to do. Mountain Challenge has influenced my career by making me want to work in the same type of environment. I want to work somewhere that is filled with people doing what they enjoy and are passionate about that also helps others and stresses care of the environment. I am still searching for this perfect position as Mountain Challenge has a lot for any other position to live up to, but I know what I want and I am able to incorporate lessons I learned at Mountain Challenge into everything I do.